Football-sized gems, show-stopping birds who strut their stuff, dry ice, liquid nitrogen, acorn dissecting, dancing corn and “blubber” gloves are among the Perot Museum of Nature and Science’s festive lineup of holiday happenings. The museum invited us to a special presentation to learn about it The Birds of Paradise exhibit was the highlight but we learned some other cool things that I can't wait to share! 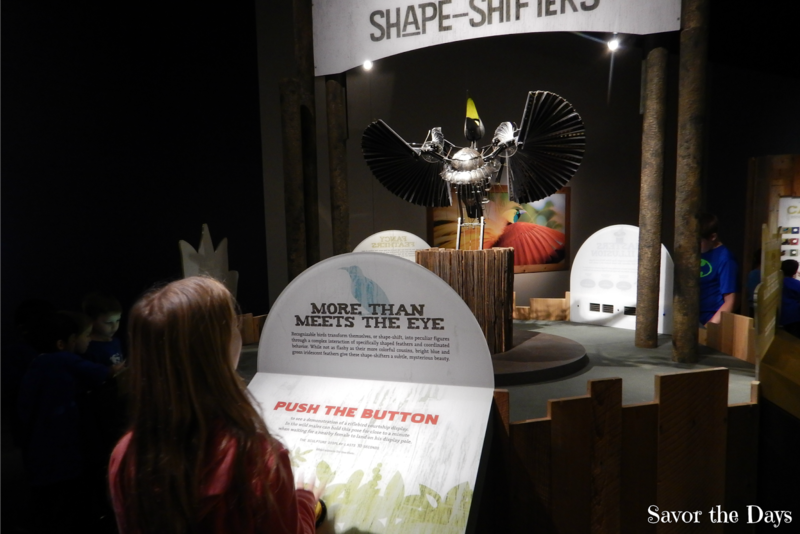 Keep reading to learn how to enter to win a 4 pack of VIP tickets to the Perot! We learned about the new Brainiacs that you will see throughout the museum. Brainiacs can't wait for you to "talk nerdy" with them. They will be located on each level and they are available to talk to you about the different exhibits or just answer your wild and crazy science-related questions. We got to watch them do some cool science demonstrations for us. Rachel loved the presentation and couldn't wait to get a picture with some of the Brainiacs that we met. She said that would be an awesome job to have. Afterwards we talked to some other Brainiacs. Here we talked about differences between the red fox and the arctic fox such as different teeth structure, different coat colors, etc. Next we talked about birds, their different habitats, and even the differences in their eggs. Rachel got to hold an ostrich egg! At the pinnacle of the event was the groundbreaking Birds of Paradise exhibition, where the adventures and stories behind the first survey of all 39 birds-of-paradise are documented and brilliantly displayed. BIRDS OF PARADISE (through Jan. 8, 2017) is a story of nature’s most fascinating feathered flirts. A science exhibition, art show and natural history display in one, Birds of Paradise, co-produced by National Geographic and the Cornell Lab of Ornithology takes visitors on an expedition to a New Guinea rainforest to witness the spectacular plumage and dazzling dance moves of the family of birds known as birds-of-paradise. Kids (and adults!) can learn and test their bird moves at this interactive and competitive Bird of Paradise game. We enjoyed learning about how the riflebird transforms or shape-shifts into unusual poses and stays that way for up to a minute as part of their mating dance. That's nature's "mannequin challenge"! 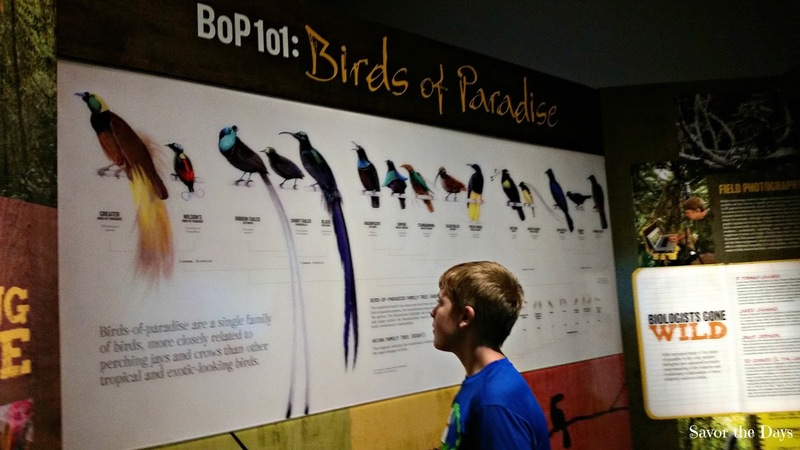 Of course, as always with the Perot Museum, there are plenty of interactive displays to help kids learn more about Birds of Paradise, their behavior, habitats, etc. It was interesting to learn that even though all of these birds are considered Birds of Paradise, each species has unique features including distinct bird calls. 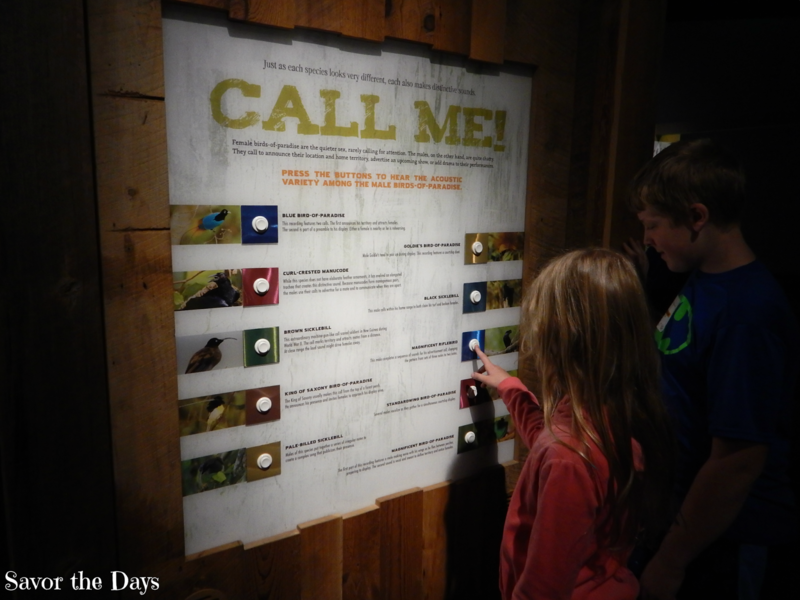 Kids love pressing the buttons and hearing each of the calls. Look at all the different species of Birds of Paradise! Nicholas' favorite is the black sicklebill. Through beautiful National Geographic photography, we followed the adventures of two determined researchers who made 18 trips to New Guinea over eight years to complete the first survey of all 39 known species of birds-of-paradise. We watched a video about Tim Laman, field biologist, photographer, researcher, and explorer. Nicholas was fascinated with the idea of combining nature exploration and photography as a career. 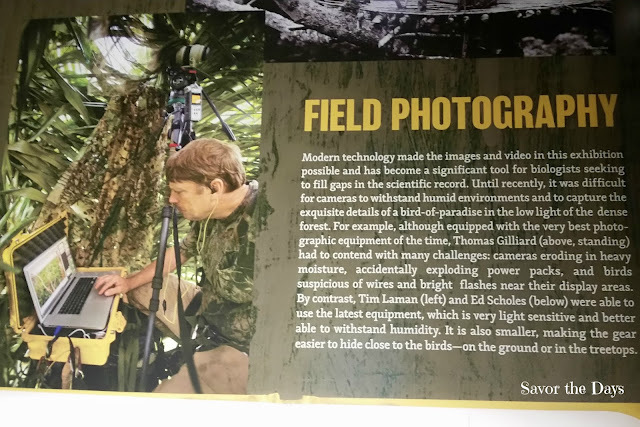 I'm so grateful that the Perot Museum included this back story to their exhibit because my son is excited to learn more about expedition photography. I have to say that I would have loved to have done this for a career too! 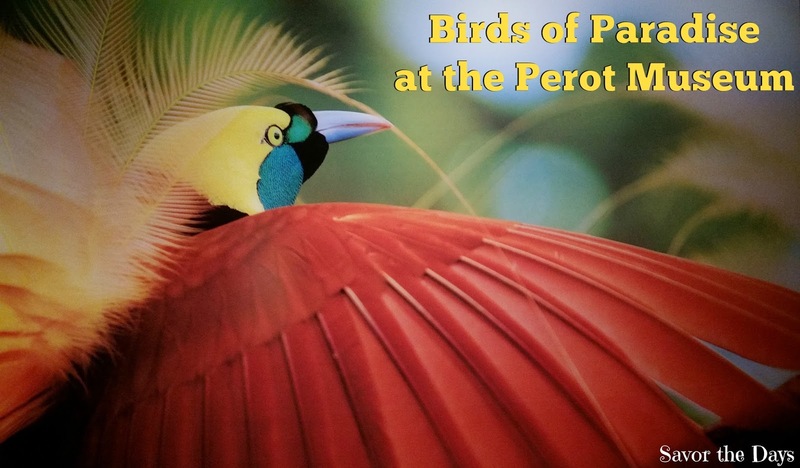 Once you've seen the fabulous Birds of Paradise exhibit, be sure to check out all of the other amazing activities going on at the Perot Museum of Nature and Science over the holidays! WINTER BREAK. The kids are out of school, and parents can keep young minds alert during the winter holidays. At select times during winter break Dec. 24-Jan. 8 (except for Dec. 25), guests of all ages can enjoy daily brain-boosting experiences, from bookworm readings and science trivia to activities and demos such as acorn dissecting, pine cone science, blubber gloves, dancing corn, holiday table “magic” and more. Plus, little ones ages 5 and under can enjoy themed crafts such as turkey headbands and “polar opposites” animal art daily until 3 p.m. Activities are free with general admission. Visit perotmuseum.org/holiday for daily schedules. From Dec. 27-30, winter Discovery Camp will take pre-K through 4th graders into the “cool science” worlds of robotics, chemistry and the marine biology of Arctic creatures. Visit perotmuseum.org/camps for registration and additional details. 2017 NATIONAL GEOGRAPHIC LIVE! SPEAKERS SERIES. Call it story time for adults. The 2017 National Geographic Live! Speaker Series kicks off Jan. 5 with Hilaree O’Neill, the first woman to climb the world’s first- and fourth-tallest mountains (Mount Everest and Lhotse, respectively) in under 24 hours. As a professional skier, mountaineer, writer and mother, O’Neill will discuss her many adventures in Hilaree O’Neill: Point of No Return. The series continues on March 2 with aquatic ecologist Zeb Hogan, host of Nat Geo’s Monster Fish TV show, plus NFL cheerleader-turnedprimatologist Mireya Mayor on May 4. All three talks will take place at 7 p.m. in The Hoglund Foundation Theater, a National Geographic Experience. Season ticket packages are $75 for Museum members and $90 for non-members. Individual tickets are $30 for Museum members and $35 for non-members. National Geographic Live! is presented by Charles Schwab & Co., Inc. HOURS. General hours of operation for the Perot Museum are 10 a.m.-5 p.m. Monday through Saturday and noon-5 p.m. Sunday. On the first Thursday of each month, the Museum will remain open until 9 p.m. for First Thursday Late Night. Holiday and other special hours. The Perot Museum will close Dec. 25 (Christmas). The Museum will offer extended hours until 7 p.m. Dec. 26-Jan. 1, except for Dec. 24 (Christmas Eve) when the Museum will close at 3 p.m. and Dec. 31 (New Year’s Eve) when the Museum will close at 5 p.m.
Member-only mornings. From 9-10 a.m. every Saturday and 11 a.m.-noon every Sunday, members can enjoy exclusive access to the Perot Museum, plus member-only access to the Moody Family Children’s Museum on Mondays from 10 a.m.-noon. TICKETS. Museum general admission is $19 for adults (18-64), $12 for youth (2-17) and $13 for seniors (65+). Museum general admission is free for members. Admission to the theater is $6 for a short film (20-25 minutes) and $8 for a long film (40 minutes). For members, admission to the theater is $5 (short film) and $6 (long film). Films and general admission for children under 2 are free. For groups of 10 or more, call for special rates at 214-428-5555 ext. 8. All prices are subject to change. Birds of Paradise requires a surcharge for a total admission cost of $27 for adults (18-64), $19 for youth (2-17), $20 for seniors (65+), and free for children under 2. Member tickets are $6 for adults (18-64) and $5 for youth (2-17) and seniors (65+). The Perot is SO much fun!! We love to do fun things like this...especially during the holidays when we have a break from school! I love giving gifts at Christmas. I shop all year round and when Christmas comes I love to pull out all the boxes and give gifts to friends, neighbors, and family. My favorite Christmas tradition is sitting in front of a fire and watching our favorite Christmas specials/ movies we have on DVD. Thank you for the chance to win! We love to go out at night and see neighborhoods of pretty lights! I would love these! My children would really learn from this exhibit. Thanks! Congratulations Julie! You won the tickets! I'll contact you directly about how to get the tickets to you.